That has the chance at being one of my favorite chapter covers. Thanks for the release! 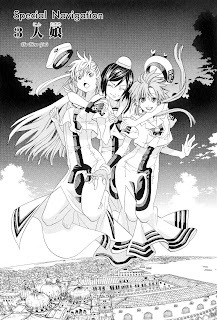 There's no better start for the day, than reading an Aria chapter while listening Aria Piano OST in the background! Thank you Amano & ACS for another beautiful, heartwarming release! Nice chapter. But why is Athena just sitting there without saying anything? It would have been nice if she had participated somewhat, since she's such a sweetheart. Probably she was the one who called the girls over to comfort Alice. After this, I was moved to re-read the beautiful Navigation 55, where Alice-chan graduates and noticed something curious. Top left of page 173 says "[undine history] which began with Grandma". This is incorrect, as the corresponding special navigation clearly shows how Granma Akino left the already big Himeya gondolier house to establish her private Aria Company. According to a Mensile Undine article, Himeya Company was founded in 2180AD, about 120 years before Akari arrived at Planet Aqua. Maybe Ms. Amano forgot about the story background and put incorrect text in the manga or maybe the english translation isn't precise? It could be that perhaps these symbolic history books began when Akino decided to leave the one and only Undine company at that time to start her own. This was probably considered the first big happening in the industry, seeing as she was so highly regarded among her peers. It's referring to the "a new legend has been born", confusingly worded I guess. Indeed. Very nice chapter, this. And I love the art on the cover. Very pretty. what Mez said! the translation may have thrown you off b/c it is confusing(with all due respect to the tl-er). i believe it is saying Grandma is a legend because she was the top undine for 30 yrs. What other comments said about her are all true, but the 30-yr career is what made her a legend... and now Alice is the newest-born legend, being promoted for the first time two ranks! thanks for this chapter. beautiful and funny!